Rugby league: Australia's Paul Gallen looks to offload the ball from a tackle. (2008 World Cup). Rugby is a type of football developed at Rugby School in Rugby, Warwickshire, one of many versions of football played at English public schools in the 19th century. The two main types of rugby are rugby league and rugby union. Although rugby league initially used rugby union rules, they are now wholly separate sports. 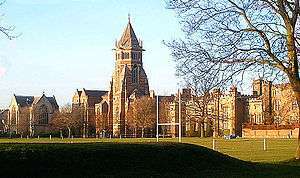 Rugby School, where Rugby football began. Rugby union: A scrum between the Crusaders and Brumbies (May 2006). Ancient Greek episkyros player on an Attic lekythos. 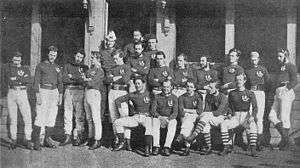 Scotland First Rugby Team wearing brown in 1871 for the 1st international, vs England in Edinburgh, 1871. A form of rugby played in 1905. Art by S.T. Dadd. 1830 Running with the ball became common in 1830s at Rugby School and Rugby School football became popular throughout the UK in the 1850s and 1860s. 1864 The first rugby clubs are formed, followed by hundreds more in Cumberland, Lancashire and Yorkshire in the 1870s and 1880s. 1876 Matthew Bloxam’s letter is published in The Meteor. 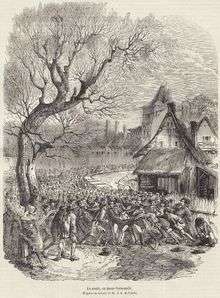 It claims William Webb Ellis, a pupil at Rugby School, picked up the ball and invented rugby. Although a Rugby Football Union inquiry in 1895 found no actual proof, it decided to perpetuate the myth. 1890 Modern points scoring is uniformly accepted by the Home Nations for the 1890/91 season. 1907 A New Zealand professional rugby team tours Britain. Albert Henry Baskerville, a Post Office clerk in New Zealand, organises a touring side branded the ‘All Golds’ in Sydney due to the players receiving a share of any profits from the tour. They play under rugby union rules in Sydney on their way to Britain and Australia’s greatest player Dally Messenger joins them on tour. They win the game’s first test series 2–1, but Baskerville dies of pneumonia on the way home at the age of 25. 1907 Rugby league spreads to Australia and New Zealand. The New South Wales Rugby Football League is founded at Bateman's Hotel in Sydney. The New South Wales Rugby League sets up an eight team competition after a row with the New South Wales Rugby Union over compensation for injured players. The first Premiership is won by South Sydney. Rugby league goes on to displace rugby union as the primary football code in New South Wales and Queensland. 1929 Firs rugby league Challenge Cup Final is played at Wembley. Wigan defeat Dewsbury 13–2 in front of 41,500. 1930 Unprecedented fourth rugby league test match played between Britain and Australia at Rochdale after third test is drawn 0-0. Britain win the test 3-0 to take the Ashes. 1954 First Rugby League World Cup, the first for either code of rugby, staged in France. Great Britain beat France 16-12 in final at Parc des Princes, Paris. 1958 Great Britain defeat Australia 25-18 in the second rugby league test match with only eight fit players on the pitch. Alan Prescott plays for 77 minutes with a broken arm. 1971 New Zealand wins a rugby league series in Britain for the first time since the original 1907-08 tour. 1978 New Zealand rugby union tour of Britain and Ireland - New Zealand completes Grand Slam of victories over England, Ireland, Scotland and Wales for the first time. 1996 Bath Rugby and Wigan RLFC, England's top union and league sides respectively, made history by playing against each other at both codes of rugby. The first match was at Maine Road, Manchester under league rules, Wigan beating Bath 82–6; then two weeks later the return match was held at Twickenham under union rules, Bath 44 beating Wigan 19. 2008 Rugby league holds its first World Cup since 2000, with New Zealand defeating Australia in Brisbane by a score of 34-20 in the final to take their first Rugby League World Cup. 2015 New Zealand defeat Australia 34-17 at Twickenham Stadium, England, in the eighth rugby union World Cup, held in the United Kingdom. In doing so, New Zealand becomes the first team to win consecutive titles. 2016 Inaugural season of PRO Rugby in the United States. Rugby union is both a professional and amateur game, and is dominated by the first tier unions: Argentina, Australia, England, France, Ireland, Italy, New Zealand, Scotland, South Africa and Wales. Second and third tier unions include Brazil, Canada, Chile, Colombia, Fiji, Georgia, Germany, Japan, Mexico, Namibia, Peru, Portugal, Romania, Russia, Samoa, Spain, Tonga, the United States, Uruguay and Venezuela. Rugby Union is administered by World Rugby (WR), whose headquarters are located in Dublin, Ireland. It is the national sport in New Zealand, Wales, Fiji, Samoa, Tonga and Madagascar, and is the most popular form of rugby globally. The Olympic Games have admitted the seven-a-side version of the game, known as Rugby sevens, into the programme from Rio de Janeiro in 2016 onwards. There was a possibility sevens would be a demonstration sport at the 2012 London Olympics but many sports including sevens were dropped. In Canada and the United States, rugby union evolved into gridiron football. During the late 1800s (and even the early 1900s), the two forms of the game were very similar (to the point where the United States was able to win the gold medal for rugby union at the 1924 Summer Olympics), but numerous rule changes have differentiated the gridiron-based game from its rugby counterpart. Among unique features of the North American game are the separation of play into downs instead of releasing the ball immediately upon tackling, the requirement that the team with the ball set into a set formation for at least one second before resuming play after a tackle (and the allowance of up to 40 seconds to do so), the allowance for one forward pass from behind the site of the last tackle on each down, the evolution of hard plastic equipment (particularly the football helmet and shoulder pads), a smaller and pointier ball that is favorable to being passed but makes drop kicks impractical, a generally smaller and narrower field measured in customary units instead of metric (in some variants of the American game a field can be as short as 50 yards between end zones), and a distinctive field (shaped like a gridiron, from which the code's nickname is derived) with lines marked in five-yard intervals. Distinctive features common to both rugby codes include the oval ball and throwing the ball forward is not allowed, so that players can gain ground only by running with the ball or by kicking it. As the sport of rugby league moved further away from its union counterpart, rule changes were implemented with the aim of making a faster-paced and more try-orientated game. Set pieces of the union code include the "scrum", in which packs of opposing players push against each other for possession, and the "line-out", in which parallel lines of players from each team, arranged perpendicular to the touch-line, attempt to catch the ball thrown from touch. A rule has been added to line-outs which allows the jumper to be pulled down once a players's feet are on the ground. In England, rugby union is widely regarded as an "establishment" sport, played mostly by members of the upper and middle classes. For example, many pupils at public schools and grammar schools play rugby union, although the game (which had a long history of being played at state schools until the 1980s) is becoming increasingly popular in comprehensive schools. Despite this stereotype, the game, particularly in the West Country is popular amongst all classes. In contrast, rugby league has traditionally been seen as a working class pursuit. Another exception to rugby union's upper class stereotype is in Wales, where it has been traditionally associated with small village teams made up of coal miners and other industrial workers who played on their days off. In Ireland, rugby union is a unifying force across the national and sectarian divide, with the Ireland international team representing both political entities. Those considered to be heavily involved with the rugby union lifestyle—including heavy drinking and striped jumpers—sometimes identify as “rugger buggers”. In France, rugby is widely played and has a strong tradition in the Basque, Occitan and Catalan areas along the border regions between Spain and France. The game is very popular in South Africa, having been introduced by English-speaking settlers in the 19th century. British colonists also brought the game with them to Australia and New Zealand, where the game is widely played. It has spread thence to much of Polynesia, having particularly strong followings in Fiji, Samoa and Tonga. Rugby union continues to grow in the Americas and parts of Asia as well. In rugby union, World Rugby regulates the size and shape of the ball under Law 2 (also known as Law E.R.B); an official rugby union ball is oval and made of four panels, has a length in-line of 280–300 millimetres, a circumference (end to end) of 740–770 millimetres, and a circumference (in width) of 580–620 millimetres. It is made of leather or suitable synthetic material, and may be treated to make it water resistant and easier to grip. The rugby ball may not weigh more than 460 grams or less than 410 and has an air pressure of 65.71–68.75 kilopascals, or 0.67–0.70 kilograms per square centimetre, or 9.5–10.0 lbs per square inch. Spare balls are allowed under the condition that players or teams do not seek an advantage by changing the ball. Smaller sized balls may also be used in games between younger players. Much larger versions of traditional balls are also available for purchase, but these are mainly for their novelty attraction. The Rugby World Cup, which was first held in New Zealand and Australia in 1987, occurs every four years. It is an international tournament organized by World Rugby. The event is played in the union format and features the top 20 teams from around the world. The Rugby League World Cup was first held in France in 1954, and as of 2013 occurs on a 4-year cycle. It is an international tournament that is organized by the Rugby League International Federation. The event is played in the league format and features the top 14 teams from around the world. The current world champions are Australia, who won the world cup in 2013, played in England, Wales, France and Ireland. Rugby shirts were formerly made of cotton but are now made of a cotton and polyester mix. This material has the advantage of not absorbing as much water or mud as cotton alone. Owing to the more aggressive nature of the game, rugby clothing in general is designed to be much more robust and hardwearing than that worn for soccer. Like most team sports, both forms of rugby are vulnerable to match fixing, particularly bets involving easily manipulated outcomes, such as conceding penalties and first point scorer. A recent example is a deliberate infringement by Ryan Tandy in order for the first points scored to be a penalty goal in a 2010 NRL match; the attempt backfired when instead of taking a shot at goal, a try was scored. ↑ Gilbert, Ian (10 October 2003). "The bluffer's guide". The Age. Retrieved 27 May 2012. ↑ "International Rugby Board – News". Irb.com. Retrieved 30 May 2011. ↑ "PNG vow to upset World Cup odds". Rugby League. Federación Peruana de Frontón. 15 October 2008. Retrieved 3 July 2009. But it would still be one of the biggest shocks in World Cup history if Papua New Guinea - the only country to have rugby league as its national sport - were to qualify for the last four. ↑ International rugby board. "Rugby ball laws" 22 Feb. 2010. Archived 11 July 2012 at the Wayback Machine. Wikimedia Commons has media related to Rugby football. Wikivoyage has a travel guide for Rugby football.